Christos is the Head of the Company & Commercial Department. He specialises in general corporate work, banking, capital markets and private equity transactions, as well as the tax aspects of such transactions. Christos has also acted domestically and internationally for many companies involved in debt restructuring and recapitalisation as well as working for administrators and liquidators on several high profile insolvencies. Christos has been the Secretary of the International Tax Planning Association (I.T.P.A. ), is a member of the Offshore Institute, founding member of the Mediterranean Maritime Arbitrators Association and is an associate member of the Chartered Institute of Arbitrators. He has published numerous articles in international magazines and has presented various legal issues at international conferences and seminars. 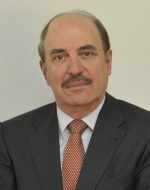 He is a member of the board of directors of Cypriot and foreign public companies as well as of many private limited liability companies. Chrysses Demetriades & Co. LLC is a Cyprus law firm providing a comprehensive range of legal services to local and international clients.We have been instrumental to the development of Cyprus as an offshore and international financial centre and are widely acknowledged as one of the leading law firms in Cyprus in the key areas of corporate activity. We have long established relationships with many of the world’s leading international financial institutions, professional advisers and regulatory bodies, are consistently highly rated in independent research studies and regularly lead offshore league tables. Our success is founded on our ability to provide practical, creative and cost-effective advice, combined with an uncompromising service commitment to our clients and a strong dedication to our lawyers, staff and the communities in which we practice.